Why then do you tolerate the treacherous? swallow up those more righteous than themselves? Habakkuk is one of the minor prophets in the Bible, and likely a contemporary of prophets like Jeremiah and Zephaniah. Babylon was making her westward move toward world conquest – we know now that there will be a 70-year period of captivity of the Israelites under Babylon. The book of Habakkuk is known to be unique as instead of bring God’s message directly to the people as per all the other prophets, acting as the voice of God; Habakkuk instead takes the complaints of the people directly to God in a confrontation full of questions, acting as the voice of the people. Through Habakkuk’s questions, and the answers given by the Lord, we see how Habakkuk finds his own peace and understanding. In this study, we will examine the extent of the treachery that Habakkuk and the people of his time were subjected to, and what kind of attitude we should have when dealing with similar questions. 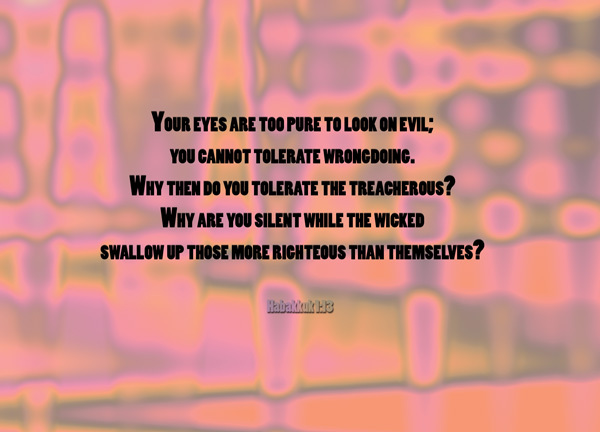 Your eyes are too pure to look on evil; you cannot tolerate wrongdoing – Surely you would agree with Habakkuk that the Lord our God is a holy and pure God. His holiness and purity cannot be compromised – it’s like a piece of white sheet of paper that can never be stained, that will never allow itself to be stained. Indeed, even the purest or the holiest of men cannot claim to be wholly pure or truly holy when they come to stand before the Lord, for in contrast to his perfect purity, even the purest of men will be deemed as impure. Is wrongdoing pure or impure? That much is obvious – wrongdoing cannot be pure. If wrongdoing is impure, and God’s purity cannot be compromised, then logically speaking, God and wrongdoing don’t mix. God cannot tolerate wrongdoing. Why then do you tolerate the treacherous? – If God is so pure, why, then, does he cast his pure eyes upon our wrongdoings? If God is so pure, and his purity cannot be compromised, why then, does he tolerate the treacherous? Habakkuk speaks as if in horror. We need to understand the context behind Habakkuk’s question. In the earlier parts of the book Habakkuk complains and cries out to the Lord for the evil that the Jews are doing – they had turned away from God and are turning to idols and have walked down the sinful paths. Habakkuk cried for deliverance, and God did something indeed, though not quite what Habakkuk expected. God sent the Chaldeans (the Babylonians) to attack the Jews. The Chaldeans were historically known to be a savage and cruel tribe of people – often considered as Barbaric. while the wicked swallow up those more righteous than themselves? – why did God tolerate using a more evil agent to deal with the lesser evil? In all these, the truly righteous ones, like Habakkuk, suffered the most. Yet the prophecies came true. Judah was destroyed, as was Israel. The last reigning king of Judah, Zedekiah, was put on the throne by the Babylonians, but he did evil in the eyes of the Lord [2 Kings 24:19]. It was because of the Lord’s anger that all this happened to Jerusalem and Judah, and in the end he thrust them from his presence [2 Kings 24:20]. King Zedekiah rebelled, got captured, lost Jerusalem, and was blinded after having witnessed his sons being killed before his eyes. The image of his sons’ murder would be forever etched onto his memory [2 Kings 25:7|Article]. That was how evil the Babylonians were. Why are you silent – It often seems like God is sleeping. It often seems like God is not looking, God is not aware of the victories that the evil and the treacherous are claiming. Afterall, if he was watching, if he knows about these, why would he allow it? Why is he not doing anything? We know for a fact that God knows. God sees. No evil can hide itself from him. We also know for a fact that our God does not sleep and does not rest – indeed, he who watches over Israel will neither slumber nor sleep. [Psalm 121:4|Article] Yet it is also a fact that he is often silent while the righteous suffer and the evil reign. I refer you to this passage in Psalm 73:3-14, where the righteous cries out about the injustice of it all and describes how good life seems to be for the evil, and how badly the righteous suffer. Yet the Psalmist comes to a point of reconciliation – till I entered the sanctuary of God; then I understood their final destiny [Psa 73:17]. If we are unable to look at things from the Kingdom perspective, and if we are unable to grasp the concept of eternal life, then we will never come to that point of reconciliation between the supposed justice that God stands for and the evil and treachery that still persists in this world. If we are think in terms of the life that we have after death – that which will be indefinitely longer than the temporary life that we have in this world, then we will never be able to be at peace with the suffering and trials that we have to go through as Christians, or really just as humans. God may be silent now, but it doesn’t mean he doesn’t care. It doesn’t mean that he will be eternally silent. In his own time, in his own scope, he will act, though perhaps not in ways you’d expect. God acted in a manner that Habakkuk would never have expected, and he was desperately shocked. More often than not, God uses novel methods to deal with our mess, and even though we may feel that his methods defies all rationale at that moment, in the end, God’s plans will prove wiser and better. Reblogged this on Food for Thought.